Ploceus holoxanthus was described by Hartlaub (1891) and the name means "Entirely Yellow" (Greek: holos, complete, entire; xanthos, yellow). 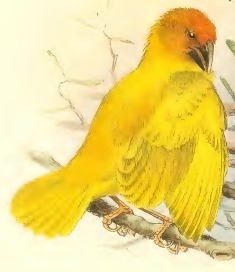 Later this taxon was considered to belong to the Eastern Golden Weaver Ploceus subaureus, commonly known as Yellow Weaver (at least in southern Africa). Ploceus holoxanthus, or Ruvu Weaver, is now thought to be a valid species (see news). So why was it not initially kept as a separate species? So Sclater 1930 and other subsequent authors simply considered holoxanthus as a synonym of Eastern Golden Weaver. The basic problem is that the Ruvu Weaver is similar to Eastern Golden Weaver, and few Ruvu Weaver specimens were known. Hartert	E	1907	Notes on African birds. Novitates Zoologicae	14:484-503. Hartert	E	1919	Types of birds in the Tring Museum. B. Types in the general collection. I. Corvidae to Meliphagidae. Novitates Zoologicae	26:123-178. Hartlaub	G	1891	Vierter Beitrag zur Ornithologie der ostlich-Ã¤quatorialen Lander und der ostlichen Kustengebiete Afrikas. Abhandlungen der Naturwissenschaftlichen Vereins zu Bremen	12: 1-46. Reichenow	A	1894	Die Vogel Deutsch-Ost-Afrikas. Geographische verlagshandlung Ditrich Reimer, Berlin. Reichenow	A	1904	Die Vogel Afrikas. Band 3. 1904-05. J Neumann, Neudamm. Sclater	WL	1930	Systema Avium Aethiopicarum. Vol. 2. British Ornithologists' Union, London. Shelley	GE	1905	The birds of Africa, comprising all the species which occur in the Ethiopian Region. Vol. 4, Part 2. RH Porter, London. Zedlitz	OG	1916	Das SÃ¼d-Somaliland als zoogeographisches Gebiet: Eine ornithologische Studie. Journal fur Ornithologie 64: 1-119.